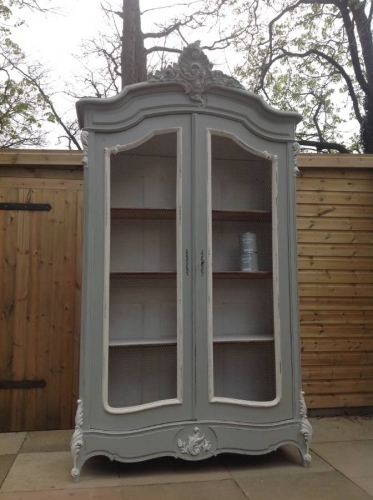 This beautiful French antique Rococo style double door wardrobe armoire dates from around 1900. It has been painted in Shutter with sel de mer highlighting and interior from our Grand Illusions paint range. The doors originally with mirrors have been replaced with galvanised wire to make it more versatile for use in a living room, kitchen or bedroom for storage or display as a bookcase for example. With a lovely carved crest to the top with scrolls of flowers and leaves. Additional highlighted carvings to the legs and carving along the base. With shelving to the interior. As with all our wooden items it has been treated with a woodworm preventative.